What a joy to at last celebrate our first Mass in the newly renovated church nave! Thank you to Melanie Pace and LOFT THREE Photography for capturing such great shots. 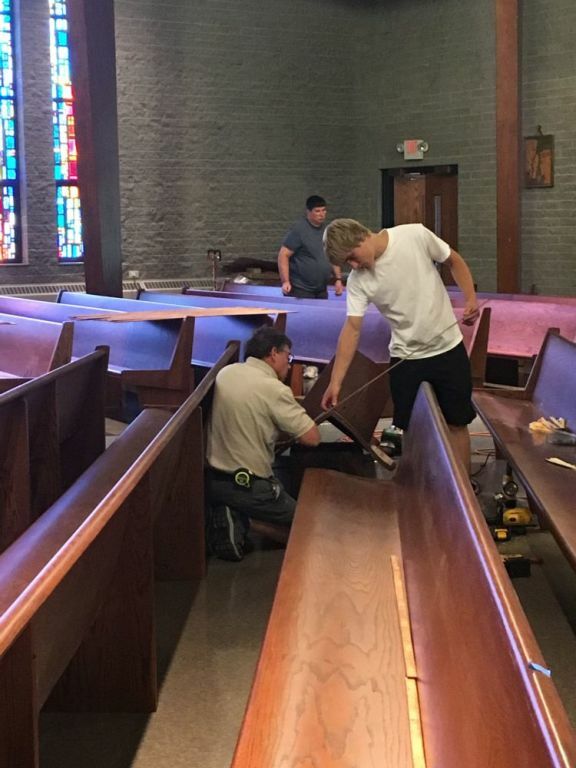 At long last, we have begun to put in the refurbished pews. We have them mostly set up right now, but we'll set them completely in place as we screw them down into the floors. We're also adding kneelers again, and then sweeping and cleaning the floors.A LOT to look forward to these next few days. Carpet is down, tile is down, flooring that will go under the pews is down, and everything is settling in. We still need to grout and wax, then do a few touch-ups throughout the church, but we're nearly finished. 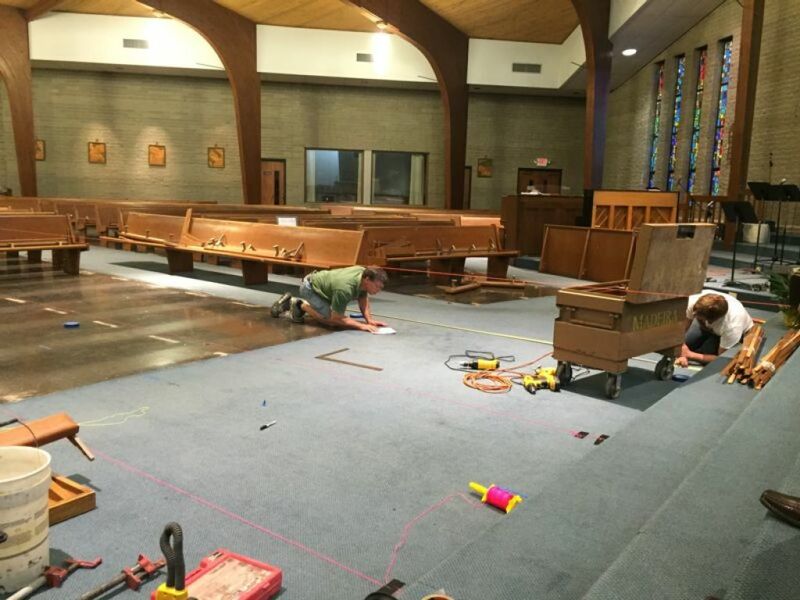 We'll begin to work on electrical wiring with the organ once the floors are finished completely, and then we'll start moving in the newly refurbished and re-sized pews next. 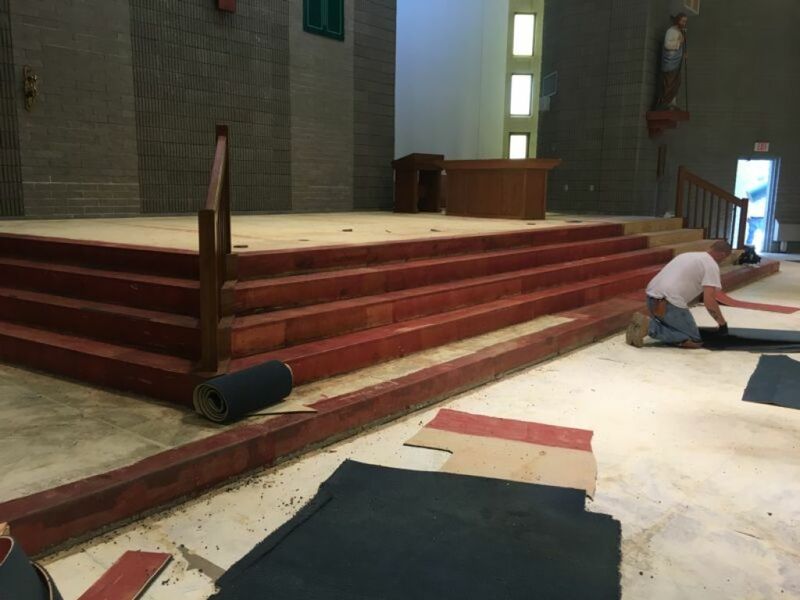 The floors where the pews go are finally being "tiled" and the beautiful aisle is being formed, as you can see in the pictures. 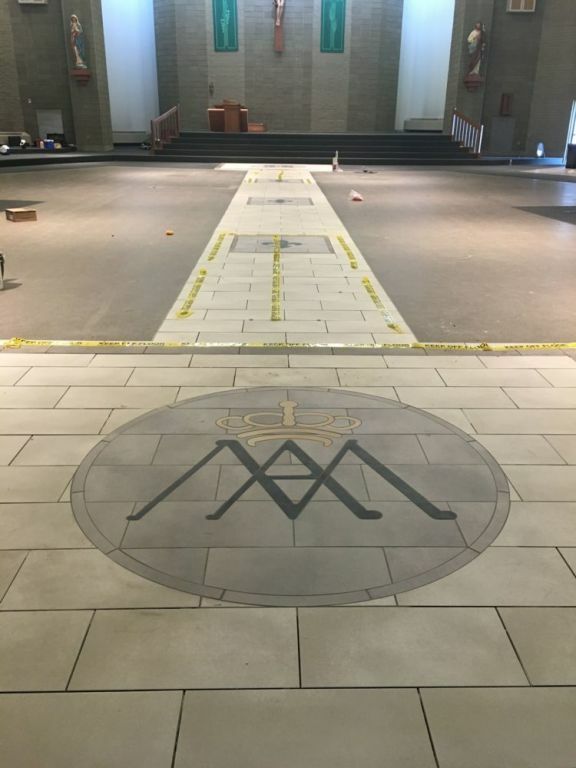 We began to piece together the Marian Seal from the original 1908 church that'll be at the back when you enter. 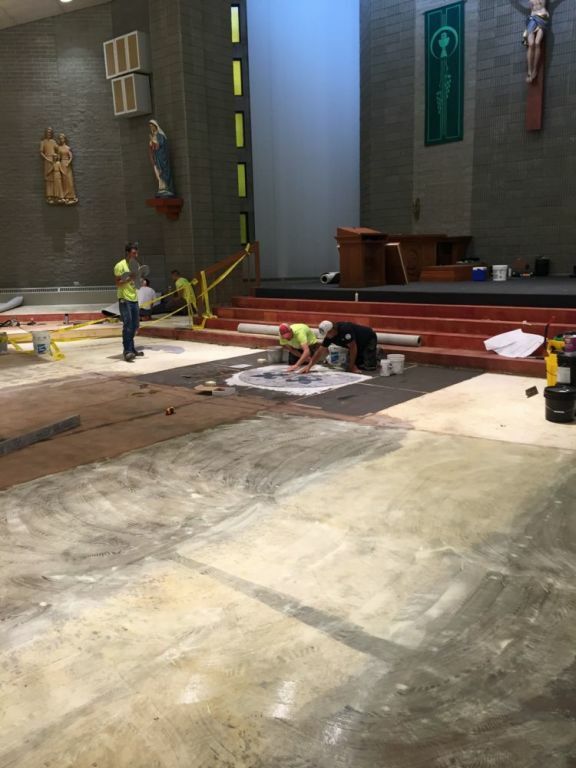 Our choir and Baptismal font areas are now carpeted and set apart from the construction. There's still much to be done, but this is a great leap forward! Groundwork! We have finally taken up all the tile and glue, and, as you can see on the left, we've begun to lay some of the beautiful new tile. 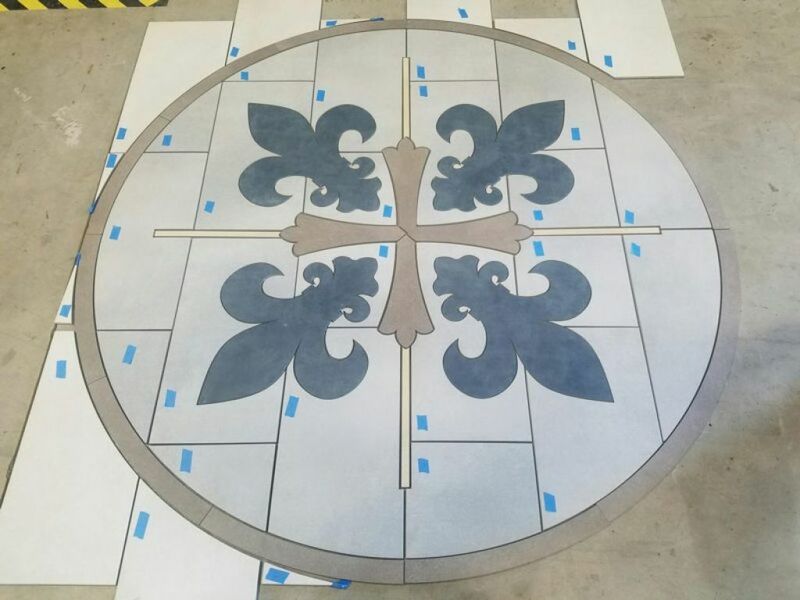 This decorative fleur design will be going down our new center aisle, surrounded by some similar designs and then some more elaborate ones.We are on track with the timeline, and expect to be back in the church in August as planned. 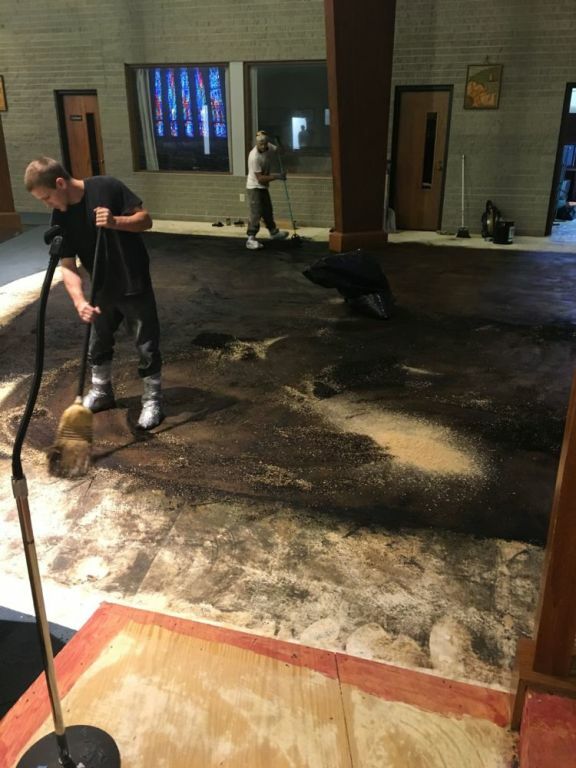 Now that we're officially out of the church building for Sunday Masses, we have been able to completely remove carpet and will start on the tile tomorrow. We're able to really push ahead with the next steps of our renovations, which means we'll be taking up the glue and ridding ourselves of the asbestos. Then, very soon, we'll be able to bring in the new tile and add the new carpet! At long last the sanctuary has been extended. 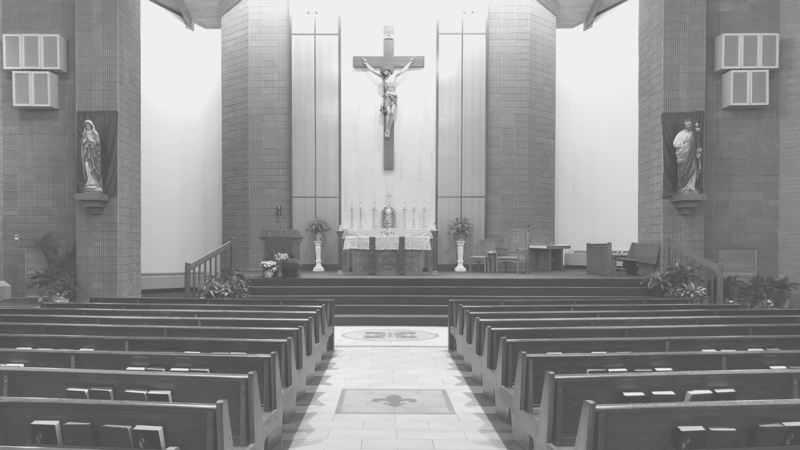 Though the step width has not changed, this extension will give the priest and serves much more space to spread out and go about their duties during the Holy Mass. This will also give a bride and groom a place to be seated in the event of a wedding. It is predicted that Fr. 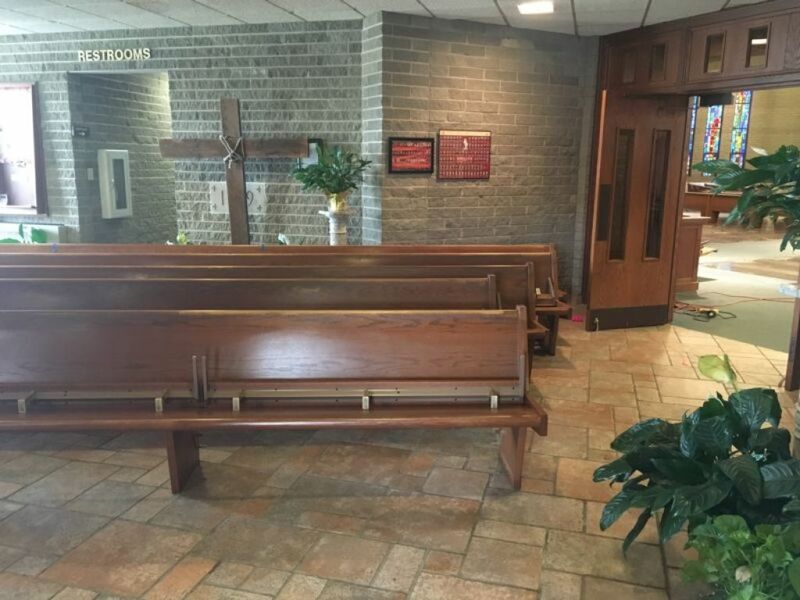 Reutter may choose to bring his seat forward and angled to the far side of the altar rather than behind it, as is appropriately done in most settings. 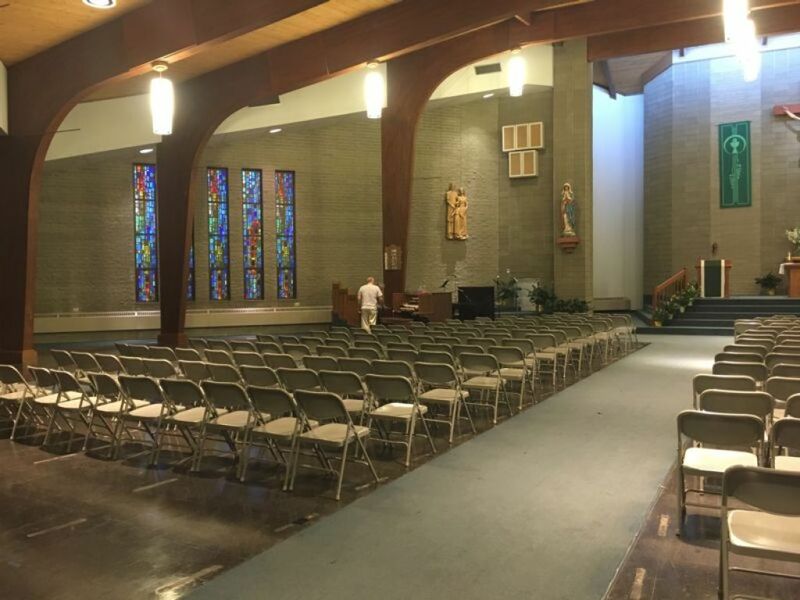 What's more, the steps extend far past where the sanctuary ends, and nearly touch the "exit" door, which will give a beautiful space for particular devotions, i.e. the Divine Mercy, Our Lady of Guadelupe, and the like. 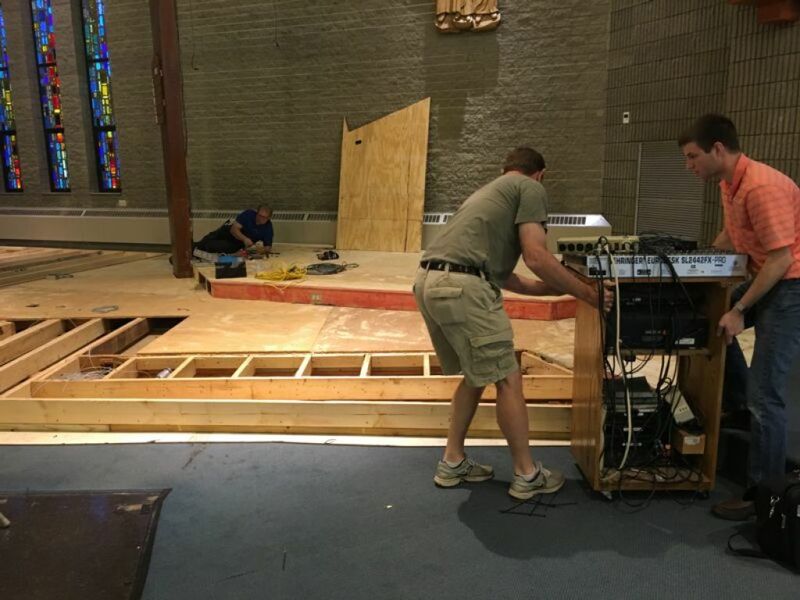 We have started the construction on the choir platform, which will now be shifted towards the back wall. 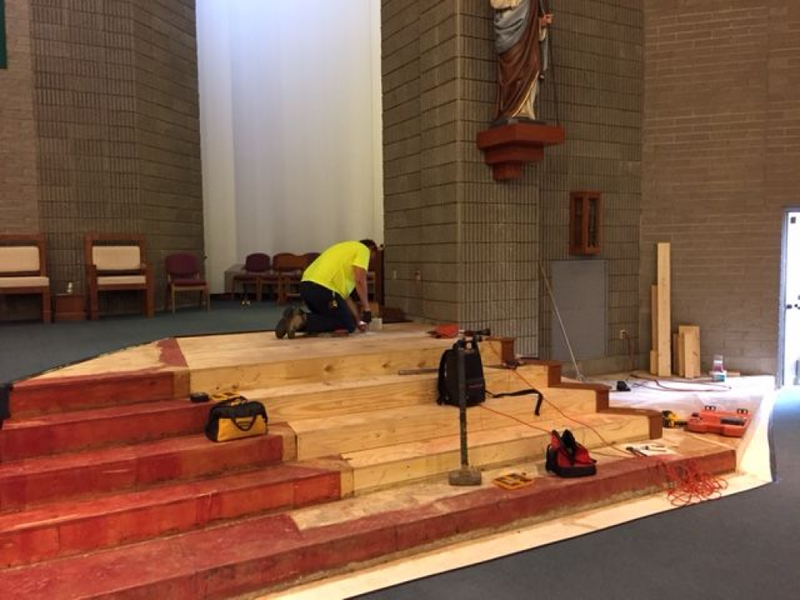 The Baptismal font will be located directly beneath the Holy Family sculpture, and the platform for that has been built as well. The organ has been moved to it's new place in the niche of the choir platform, and the underwires have been properly adjusted. The microphones are working well as of yesterday, and there has been a separate microphone made ready that will be unconnected to the full sound system; this allows more freedom to use a singular microphone versus having to turn on all the choir microphones as well. Some carpeting removed around the sanctuary and choir section. Took up the tile where the pews were and started to get the glue up to be rid of the asbestos. We'll go through each section like this.Organ, Piano, and Baptismal Fount temporarily moved to the foyer. Choir area prepared to shift and build the new platform. Stands are now in the cry room. The piano and bulkier items will be moved tomorrow. All pews were at last removed and picked up to be refurbished. The floor was swept and made ready to be prepped for tile work. Folding chairs were brought in for the Masses. 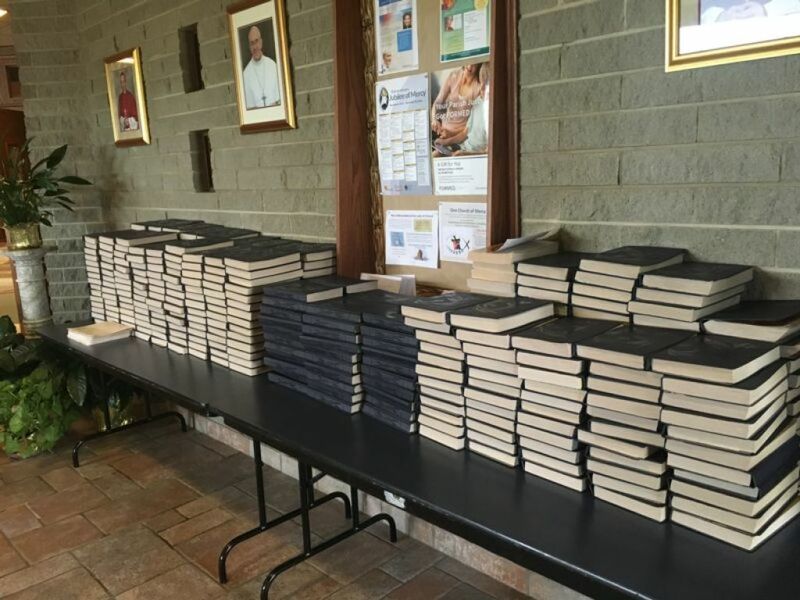 All hymnals were removed and placed in the foyer to be picked up by parishioners as they go into Mass. Pews are beginning to be taken out and cut to fit new aisles. All flooring was marked and measured for sizing of the pews.Measured out center aisle. Laid out entire floor plan with string and nails holing it in place.